If you're the new guy in a big market, it helps to have a couple of old hands to show you the ropes. So when Tiger Lu launched U.S. operations in 2006 for Sanhua Automotive, a Chinese supplier of thermal management components, he hired some old hands — in this case, a couple of savvy General Motors retirees. How do new companies gain a foothold? They often rely on managers who already know the market. Sanhua Automotive already supplied Delphi in North America with products from its portfolio of valves, heat exchangers and other climate control devices. As president of the U.S. unit, Lu served those customers and had to find new ones. What to do? He turned to Harry Eustice and Edwin Stanke, two GM retirees who were working for Sanhua in China. They agreed to return to suburban Detroit, where Lu runs a technical center in Auburn Hills. Eustice had retired from GM after a stint in its advanced thermal technology unit. Stanke boasted several patents for climate control technology, including a patent he shared with Eustice. Eustice spent two years with Sanhua in China, while Stanke was there for six. So the two executives understood Sanhua, Detroit and climate control technology. "They've done a great job," said Lu. "We appreciate their contribution." With their help, Lu developed a road map for Sanhua's expansion in North America. The company is marketing climate control components for passenger cabins, cooling systems for EV batteries and motors, and temperature control parts for transmissions. As automakers introduce EVs and hybrids, they will want to heat and cool those vehicles more efficiently, Lu said. Sanhua, which originally developed climate control systems for homes and buildings, is starting to gain recognition for its green technology. 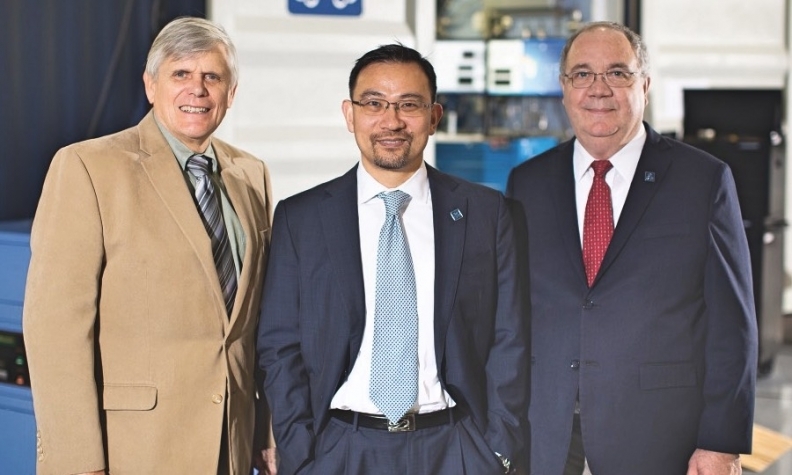 In 2017, the company won an Automotive News PACE award for designing an electronic valve that can handle carbon dioxide refrigerant, which is considered environmentally friendly. With this and other products, Lu hopes to boost Sanhua's North American automotive sales to $100 million in four or five years, up from $50 million this year. That's a small portion of Sanhua Holding Group's global sales of $3.5 billion. But it was enough to justify construction of a factory in Saltillo, Mexico. Lu oversaw construction of the plant, which began producing heat exchangers in 2015. To be sure, Sanhua has hit a couple of potholes. In 2010, the company ended an ill-fated effort to diversify when it sold its wheel business. Sanhua bailed out after encountering hefty inventories and thin margins. After that debacle, Sanhua decided to stick to its knitting — climate control components — and that decision appears to be paying off. Sanhua's North American payroll has grown to 20 staff members in Detroit, two in San Jose, and 35 in Mexico. The building blocks are falling into place. What the future holds will depend partly on Washington's trade policy. A 10 percent U.S. tariff on Chinese imports has eaten up the profit margin on products shipped from Sanhua's home base, Lu said. Would Sanhua consider building a U.S. factory to avoid the tariffs? The company's factories are highly automated, so labor costs are not high. Nevertheless, U.S.-made parts would be more costly than components made in China. But Lu said he's willing to listen if customers ask for it. "If the customer says we need to move to the U.S. — but they don't want to pay extra money — then we will negotiate," Lu said. "Our customers will be reasonable."